In a casserole, bring water to boil. Add onion, ginger, and tomatoes. Let stand for 3 minutes. Season with bagoong and continue boiling for 5 minutes. Remove the scum that rises on top of the liquid and then drop the milkfish. Simmer for 5 minutes, then add vegetables. Cook until vegetables are done. Adjust seasoning according to taste. You can use other kind of fish like tilapia or shellfish. 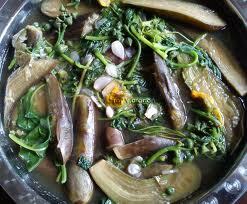 You can also use or add other vegetables like sweet potato andmalunggay fruits.